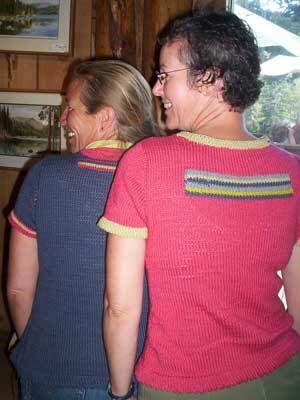 In closing, here is a fun picture of Lisette and Stephanie in their finished Ts -- love the stripes ladies! Anna H. finished her NBaT, but has to cajole her cat for a chance to wear it! Check out how well Dena's NBaT fits her. While you're there have a bit of fun with her mouse over photo trick. Lieca is happy to have a great new addition to her wardrobe. "Lisette and I had the ultimate knit along experience: we are 'knitting along' together on the granite rocks overlooking the Stanislaus River, I run out of coral colored yarn, Lisette pulls the inside thread from her ball and ... WE ARE KNITTING ALONG FROM THE SAME BALL!!" On a housekeeping note, I've cleaned up the NBaT knit along list. If I removed your name in error, please except my apologies and email me to add you back to the list. Any knit along news from you? Lynette looks fresh and cheery -- even in the hot weather -- in her finished NBaT. She already has plans for a second one. 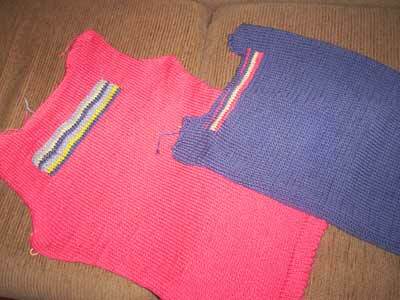 Mary-Heather has finished her "Knit Cafe" t-shirt for her store's model, Ivy. Definitely check out the embroidery she added to her T.
Beth is looking for some advice and help with her hem, can you help her? Leica is oh, so close to finishing her T-shirt -- let's go over and cheer her on to the finish line. Linda has set in her first sleeve and is seaming like a pro. 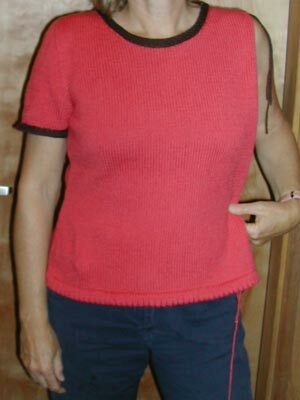 She's been fortunate enough to knit her t-shirt while taking an intermediate knitting class taught by the NBaT designer, Alison. nona's jealous! Rachael (scroll down) has added her motif to the front of her t-shirt and is counting down the days to the birth of her third child -- 18 days. Which will come first? A finished NBaT or a baby? I was walking down 24th street in San Francisco today wearing my Loopy and Lucious Shawl over my Tivoli T-shirt and this homeless guy said, "I like your scarf lady, it's neato". Thanks homeless guy! 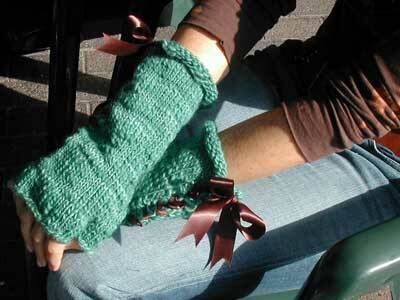 You never know who will appreciate your hand knits -- all I know is, it sure feels neato to get a compliment! Alana's NBaT is nearly complete, all done except for the embroidery she plans to add. Carina has finished her "Dream" t-shirt, the first sweater she's knit in 15 years. 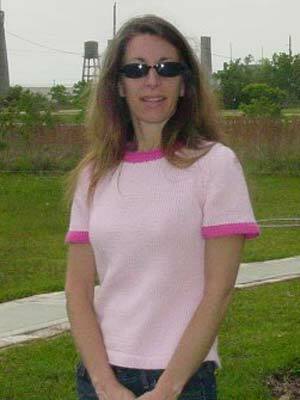 Unfortunately the weather is too hot to even think about wearing knits -- hopefully it will cool down soon! Deb is not only new to the knit along, but her NBaT is finished already! 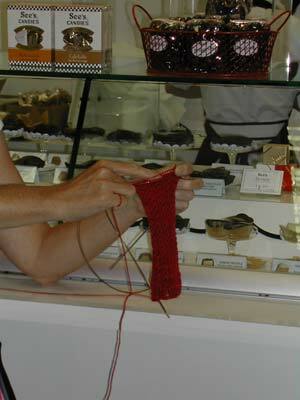 Dena is also new to the knit along and is in the midst of sorting out her Calmer gauge -- it can be tricky yarn to gauge! Leica has both sleeves and the back completed, now onto the front. Linda's NBaT features a creative "yarn tattoo" honoring her dear hubby. 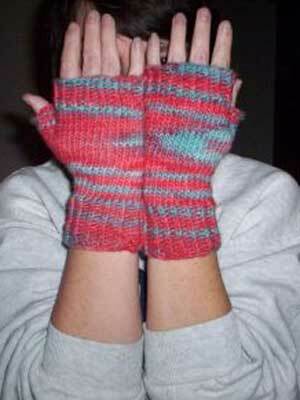 Lisette and her friend Stephanie are both new to the knit along. On a lark, they decided to knit their NBaTs on a recent trip to Tahoe -- luckily the local yarn store had the yarn and an Internet connection to print the pattern. Stephanie is a little behind her friend Lisette due to some wine sipping and subsequent ripping -- what nona calls a knitting hangover! Lynette has a pile of beautiful pieces waiting to be sewn together. Ma finished her NBaT on July 2nd, which means that Teri won her "when will my t-shirt be finished" contest. Darn, my guess just missed by 2 days! 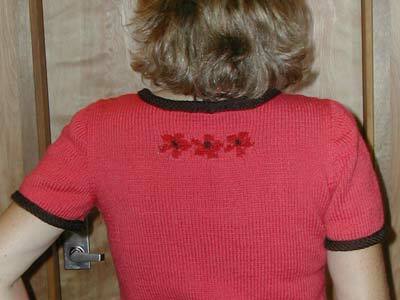 Mary Heather has a finished garment, but is still working on her embroidered word. Once her NBaT is finished, she'll display it on one of the "creepy models" in the store window of Knit Cafe. Rachael is another new knit alonger -- pop over and say hi. Sandy has finished her back and is making quick progress on her front. ShelbyD is a new knit alonger. You can track her progress on her NBaT forum. 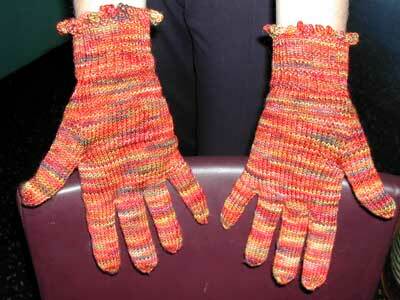 Suzanne finished her NBaT several weeks ago -- it was a gift for her sister. She recently sent me a photo of her sister wearing her special gift! Tania is in the home stretch, weaving in ends and sewing seams. What other NBaT gossip or news is out there? For you knit alongers without a blog, please feel free to email me any photos or stories you may have and I'll post them for you. 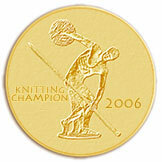 In the words of the LA note leaver, "Knit On"! Today at CommuKnity, while buying the Euroflax yarn for my Grumperina Tivoli T, nona had an interesting experience. Please excuse a quick aside from my riveting story, but did you know that this Euroflax yarn comes in many -- and I mean many -- beautiful colors? Anyway, two of the gals working at the shop, Nancy and Kate, are fellow bloggers. Nancy just so happens to be one of the NBaT knit alongers and I was lucky enough to see her T-shirt in progress, in person. Why, oh why, did I leave my digital camera at home? Being fairly new to the blog scene, this was the first time I'd met fellow bloggers face-to-face. To be perfectly honest it's really fun and a tad bit surreal -- do you know what I mean? Linda is knitting her NBaT as part of Alison's intermediate knitting class. She's in the process of shaping the shoulders using short rows instead of stair step bind offs. Lynette has been knitting her NBaT while teaching her daughter to drive and is making quick progress. AliceQ is not only new to the knit along, she's also already finished with her NBaT -- be sure to read all about her project! Cathy has finished her NBaT -- I love her color combination and the T fits her perfectly. Carina is blocking the pieces of the NBaT -- you'll never dream what word she put on the front. First things first, if you love predicting the future and/or winning yarn pop over to Ma's and enter her NBaT contest. Simply guess when you think her T will be completed -- sorry nona's already taken July 4th -- and if you're the closest guess to the actually finishing date you'll win a prize from her stash. Although Ma's NBaT was recently attached to a ball winder, she's made an impressive comeback and is once again off and running! Emily finished her T-shirt. She came up with a simple, elegant way to pick up stitches for a contrasting color neckband -- first pick up the stitches in the main color and then switch to the contrasting color before working the first row. Be sure to check out her pictures and read the other modifications she made to the pattern! Janine -- poor Janine -- had trouble with scissors while trying to make a small change to her finished neckline. Because of her mishap, her NBaT is unsewn and her front is ripped back below the neckline. Please go visit and give her some moral support! Alana is planning on working some border embroidery instead of making a ringer T -- what a creative idea! 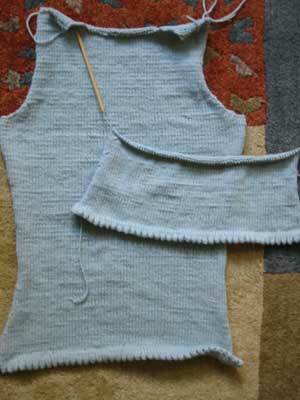 Cathy is oh-so-close to finishing her T. Her neckline turned out beautifully and she's in the seaming groove. Annamarie is our newest knit alonger. Please pop over and say hi! Sockapal-2-za is starting in a few days -- June 15th to be exact. I feel like a kid waiting for Santa to arrive -- overly excited to find out who my new pal is and what kind of socks she likes. Alison has over 350 knitters participating in this sock exchange -- let the games begin! And finally a few pictures showing nona in action on World Wide Knit in Public day. 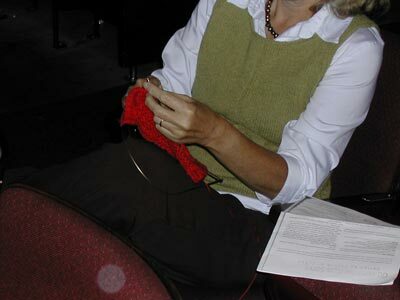 If you have a picture of yourself knitting in public on KIP day, be sure to enter Kathy's KIP photo contest! This week in the NBaT knit along, we have 2 finishers, a newbie, and someone looking to take bets. Amy has finished her NBaT. 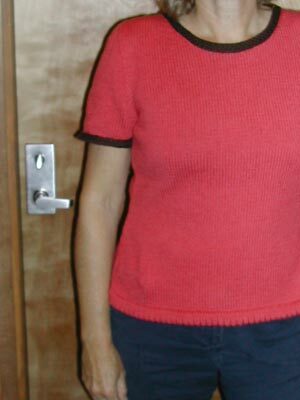 She made several interesting modifications to the pattern including a V-neck and sleeves knit from the top down -- you go girl! Details can be found on her project page. Janell is also a new finisher this week. She added a nice color twist to her NBaT. Anastacia is our knit along newbie cause hey, it's never too late to join in the fun! And last, but not least, we have Ma who is looking to take bets. Poor Ma is hooking up her NBaT to a ball winder -- we all know what that means -- and is taking bets on whether she'll have her T done by Labor Day. nona bets you'll have it done by July 4th! Does anyone have any knit along news -- or secrets -- to share? First, a rhetorical question -- aren't 3-day weekends great? Next, some exciting news -- nona's blue, meaning she's finished her NBaT. No illusions this time, I'm really done. 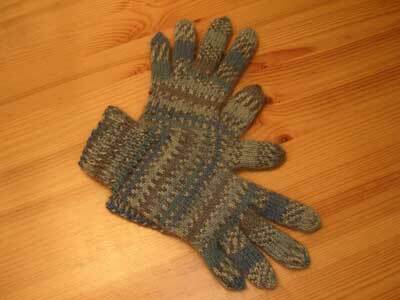 The other new bluie this week is our honorary knit alonger, Alison, who completed a store sample NBaT for her LYS. Amy has finished the front, back, and neckline of her T.
Beth is just starting her T using a bright, springy color combination. Cathy is ready to sew her pieces together and has posted a fabulous description with pictures explaining how to turn the hem using a provisional cast on. 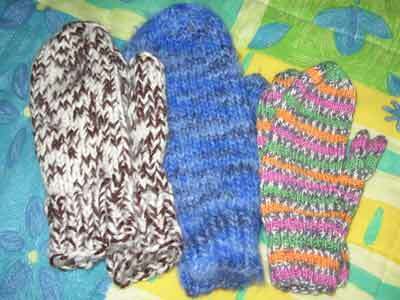 A warm welcome to 4 new NBaT knit alongers -- Allie, Jennifer K., Leica, and Phoebe -- be sure to check their blogs and follow their progress. Now, how many of you impressionable readers think my NBaT is complete? Click here for the truth behind the illusion. As a side note -- you know you're a hard-core knitter if you can walk into the living room wearing half a sweater and none -- not one -- of the nona-guys seem to think anything is amiss. Such is life at nona's house. Jackie's NBaT just makes me smile -- she looks so happy wearing her beautiful creation. Joan C. finished her 2nd NBaT in time for NYU's graduation. 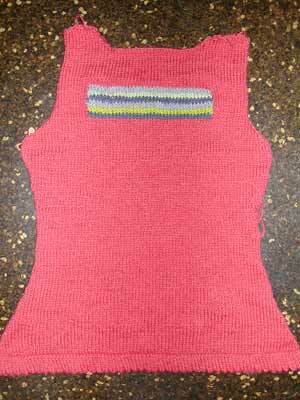 Lu knit her NBaT using Jo Sharp's Desert Garden, beautiful color combination. Margene added an intricate Chinese character -- the character for love -- to her NBaT. Please, please go check out her pictures, they are fabulous and fun! Suzanne has finished and gifted her T-shirt. I'm hoping for a picture, which I'll post for her. Cathy has just started a blog. The NBaT project is her first project knitting continental. Tania finished her front, which hopefully makes up for having to previously rip out her back. 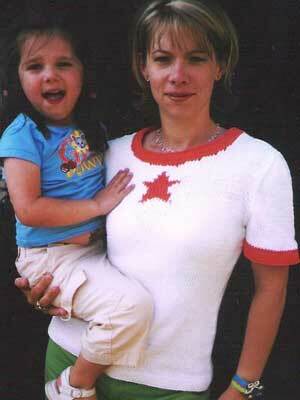 Elizabeth used her NBaT leftovers to make a terrific tank top for her daughter. As for nona, I have my bias edging pinned to the neckline and am poised to sew -- but in the meantime I'm knitting my sleeves. I'm heading up to the city -- San Francisco -- this Thursday for the Urban Knitting Studio's Knit and Wine night and hope to wear my completed NBaT. A girl can dream cannot she?